What makes an item from our recent past a collectible? It helps if it clearly defines a moment in time like 8 tracks, mood rings, bell bottoms, GI Joes, pet rocks, AM radios, Ford Falcons and poodle skirts. For musicians, especially guitar players, nothing embodies the late '70s like Electro-Harmonix effects. Many companies like DOD and MXR already made the basics - distortion, wah-wah, chorus, phase shifter and EQ but Electro-Harmonix took the same products, gave them trippy, way-out names and made them affordable. 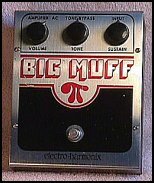 Just plug a Big Muff between your guitar and your amp, and suddenly your guitar was making a big, crunchy sound. Pop in a Doctor Q between your bass and the amp and you were George Clinton. Wanna be Peter Frampton? Plug in the Golden Throat pedal. If you traded your pedals away for drugs in the '80s, don't expect to get them back cheaply today. You can expect to pay at least $50 for most of the pedals and as much as $200 for some of the hard to find or popular issues like the Zipper, Small Clone, Vocoder and the Memory Man. If you are still going to rebuild your collection, make sure that the knobs are there and are original, and that they have all of the rubber feet. Electro-Harmonix closed shop in the early '80s but is now back and online. They are not only making new effects but they also offer several reissues of the classics.